Bhopal […] occasionally returns. Other cases of ‘environmental disasters’, other victims are still waiting for compensation. Precarity and political responsibility is yet not taken seriously outside commercial and geopolitical cartography. As I considered the trajectory of media coverage after Hurricane Katrina hit New Orleans, creating a water surge that inundated 80% of the city, I was moved to think again about the Bhopal incident and to consider more generally how the news media create the events that are constituted as “disasters,” as they focus on the immediacies of suffering and mortality and allocate responsibility. Typically, while the sudden violence of armed attacks tends to be located in the discursive space of politics, the evocation of a political vocabulary tends to be missing in the case of industrial “accidents” and other poisoned environments and in long term conditions, the “slow violence,” that make them possible. Union Carbide’s posture toward the victims of its outsourcing of dangerous work is typical of large US corporations. For example, The New York Times reported on November 23, 2013 that, “One year after the Tazreen factory fire in Bangladesh [in which more than 1200 workers died] …neither Walmart, Sears, Children’s Place nor any of the other American companies that were selling goods produced at Tazreen…have agreed to contribute to the efforts [Ango-Irish and Dutch-German companies that are involved in “getting long term compensation funds off the ground”]. 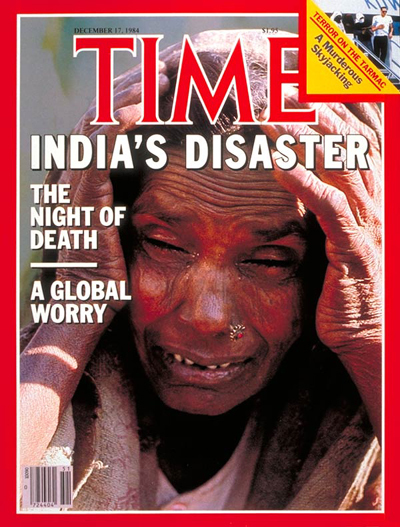 As I have suggested, the Bhopal incident (and similar ones) reveal complex relations among governments and commercial enterprises, located within a “policy dynamic that links strong and weak states… [and harbors an] invisibility, the absence of a cartography of occupational danger,” while the dominant cartography, which achieves public attention, is geopolitical/security oriented. The precarious lives of those in unsafe occupations belong to what the novelist Michel Houellebecq refers to as a different map: “…free-market economics redrew the geography of the world in terms of the expectations of the clientele, whether the latter moved to indulge in tourism or to earn a living. The flat, isometric surface of the map was substituted by an abnormal topography where Shannon was closer to Katowice than to Brussels, to Fuerteventura than to Madrid.” That commercial cartography has been no more sensitive to precarious lives than the security oriented version in evidence in The Pentagon’s New Map. Suffice it to say that a discourse of environmental accidents, in which humans face the vagaries of the elements (fires, water surges, chemical spills, etc. ), tends to trump the political economy of inequality and structures of dominations and control. That latter discourse, within which a different mode of responsibility would be enjoined, fails to achieve adequate enough traction to either protect or adequately compensate victims. “Put bluntly, in many climates rich people tend to take the higher land leaving to the poor and working class land more vulnerable to flooding and environmental pestilence. [Moreover]… In New Orleans…topographic gradients doubled as class and race gradients, and as the Katrina evacuation so tragically demonstrated, the better off had cars to get out, credit cards and bank accounts for emergency hotels and supplies, their immediate families likely had resources to support their evacuation, and the wealthier also had the insurance policies for rebuilding. * Michael J. Shapiro is a Professor, philosopher, and writer currently teaching at the University of Hawaii. His work is often described as “postdisciplinary,” drawing from diverse fields (critical theory, cultural studies, film, literary theory, African American studies, geography, psychoanalysis, indigenous politics etc.) He has published extensively in various journals and to name only very few of his famous books, we refer to the very recently published War Crimes, Atrocity, and Justice as well as Violent Cartographies, Cinematic Geopolitics, Methods and Nations, For Moral Ambiguity, Sovereign Lives. During his long teaching career, Shapiro has taught a variety of creative post-disciplinary courses both in the US and in Europe and invited students to reflect on the way in which art produces relevant texts for critical political analysis. ← Soma, Ermenek, Yırca: Can anti-coal activists defend coal miners and olive farmers?